Eastern Mennonite University is expanding its clinical laboratory space and adding simulation equipment to meet a growing national demand for highly qualified nurses. The enhanced capacity will allow the nursing program to increase the number of graduates from an average of 48 to 64 each year. The university currently offers a pre-licensure, four-year bachelor’s degree and 15-month accelerated second degree program, both of which have more qualified applicants than space available. Graduates are both highly qualified – with a National Council Licensure Exam first-time pass rate above the national average – and highly sought after. Nearly 100 percent are offered positions during their senior year. Many of these graduates, around 80 percent, work at Sentara RMH, Augusta Health and the University of Virginia Hospital System. Eight beds, bedside cabinets and overbed tables ($16,000). Three Susie nursing simulators ($27,900). One HAL medical simulator ($55,000). Additional simulation equipment: Eight oto-ophthalmoscopes, two pulse oximeters, eight sphygmomanometers, two automatic vital sign machines, eight IV pumps, eight IV poles, eight thermometers ($10,000). Eight wall-mounts to simulate oxygen hook-ups, suction hook-ups, and monitor mounts ($4,000). With more beds and simulators, more students will be better able to practice scenarios and meet clinical-learning hour requirements. In addition to receiving comprehensive training for their field, EMU nursing students learn a “Sacred Covenant” model of practice that emphasizes service, empathy, empowerment, self-giving love and relationships. 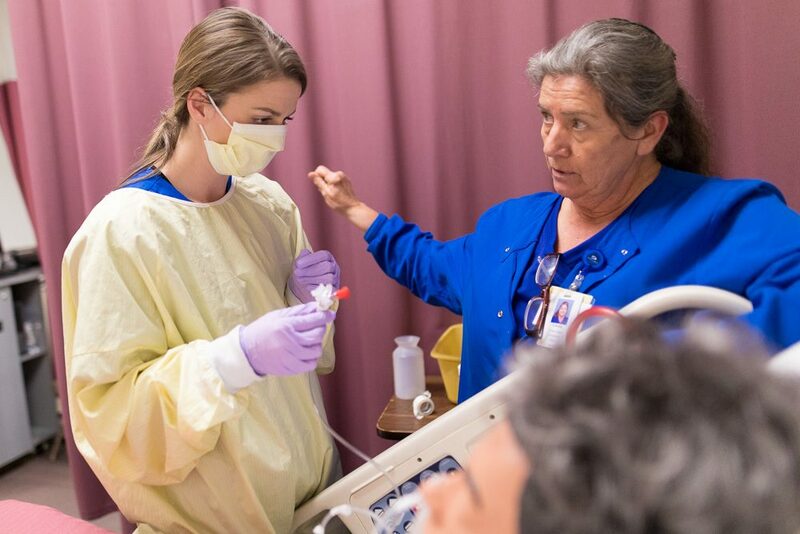 This model prepares graduates “to compassionately walk with their patients, colleagues and families in times of need, joy and grief,” Yoder said. Graduates routinely praise the preparation offered by EMU’s nursing education, and many return to the MSN program. The nursing simulation lab memorializes Lisa Haverstick ‘91, who died in 2004 after a three-week battle with pancreatitis. Donations from her family and friends and a grant from Anthem Blue Cross and Blue Shield helped to equip the lab with technology including a SimMan manikin and more. The Lisa Haverstick Endowment Fund provides additional support for ongoing equipment needs.